Rightware, the leader in automotive UI technology, will be exhibiting at the IAA International Motor Show in Frankfurt/Main from September 14-17, 2017. We will also be participating in the press days from September 12-13. At our booth in the New Mobility World area (Hall 3.1), we will be demonstrating our flagship user interface development tool Kanzi UI, as well as our latest product Kanzi Connect, a connectivity platform enabling a seamless connected user experience in the modern digital cockpit. We will also be delivering two presentations in the Speakers’ Corner. Our new "Intelligent UI" showcases natural speech interaction with the car and online services, powered by Watson from IBM. The original version of our “Companion” demonstration shows how Kanzi Connect can seamlessly extend the automotive UI by incorporating functionality from a personal mobile device. In that case, we showed a Renesas R-Car M2 platform running Linux, augmented with the Google speech recognition service on an Android smartphone. At IAA, we will be showing how we have easily extended this concept to integrate even more online services into the user experience. The connected UX demo “Triton” shows how the user interfaces of multiple in-car displays such as the instrument cluster, the infotainment system, the HUD, and a personal mobile device can be seamlessly connected. 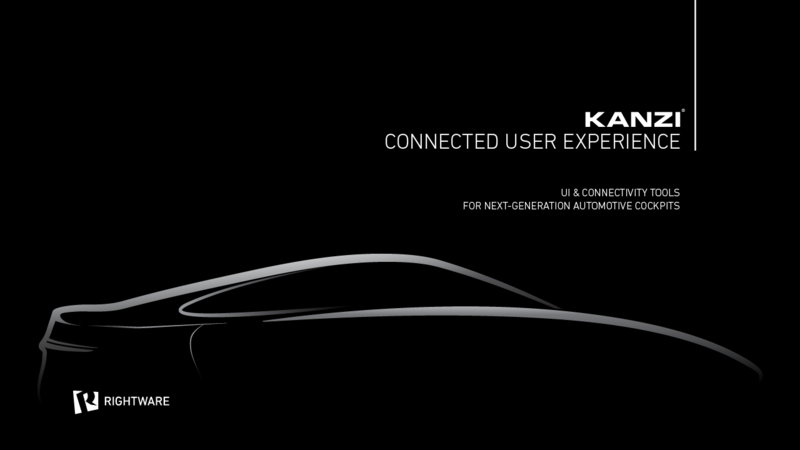 Powered by Kanzi Connect, this demo shows how auto manufacturers can rapidly develop multi-display user experiences with a unified look-and-feel in the car. With “Multi-Display,” we demonstrate seamless synchronization of UI content (data and graphics assets) across multiple connected tablets, using Kanzi Studio for visualization and Kanzi Connect for data sharing. By running Kanzi Connect software on each operating system driving a display, separate platforms are integrated at the user interface level into a single logical system. Our “HERE” demo shows the integration of real-time location data from HERE maps into an automotive UI developed with Kanzi. Only the limited data currently needed for visualization is rendered, resulting in high performance with a lightweight approach compared to other navigation solutions. The visually stunning digital instrument cluster “Poseidon” runs on the TI Jacinto 6 platform with QNX. This cluster was initially developed for the QNX concept car first revealed at CES 2015. The infotainment console demo "Ruska" runs on Renesas R-Car H3 with Linux. This elegant IVI user interface was developed in less than one week, showcasing how easy it is to use Kanzi Studio for fully functional prototypes. We will also be demonstrating some of the newest features of Kanzi Studio 3.5, the latest release of our UI design and development tool, such as UI theming to enable multiple OEM-selectable auto variants and driver-selectable in-dash display themes. Finally, bringing many of these technologies together in an integrated environment, we will be showing the Thundersoft e-Cockpit Solution with an instrument cluster and IVI console, each running on separate Freescale i.MX6 platforms, developed with Kanzi and seamlessly integrated with Kanzi Connect. We will be represented by management as well as HMI specialists from our technical design and customer support teams. We would love to meet you at the event to discuss in-depth HMI development topics or to explore business opportunities. Click here to request a meeting. See you in Frankfurt!